:Join Harriet, Darwin's pet tortoise, and Milton, Schrodinger's indecisive cat on a time-travelling quest of discovery, unravelling scientific exploration and religious beliefs and how they fit together. Throughout the centuries humans have been looking for answers to BIG questions - how did the universe start? Is there a God behind it? Has science explained away the need for a God, or can faith enhance scientific discovery? Harriet and Milton start their investigation with trying to discover when humans started asking these questions. First stop on the quest is cave paintings - who did them? What did they mean, and what can they show us about our ancestors? Step into Harriet and Milton's time machine, bring some snacks, and enjoy this curious quest of discovery. Written by Julia Golding, winner of the Waterstones Children's Book Prize 2006, and the Nestle Smarties Book Prize 2006. 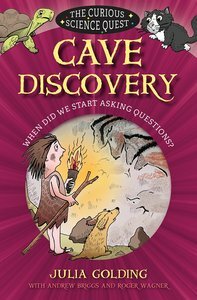 About "Cave Discovery: When Did We Start Asking Questions? (Curious Science Quest Series)"